In 1985, Grandma Bea Book, a nursery school director with a passion for taking kids on field trips, convinced her husband, Jim, to grow a hill of pumpkins on the seven acres of land behind their Shasta Avenue home in Chico, CA. She reasoned that a pumpkin patch at their own home, in addition to the goats, chickens, dairy and beef cows they raised, would create a safer destination for farm field trips than other farms they had visited. At the same time, Jim and Bea’s oldest son, Bruce, and his family had returned to Chico bringing a team of Belgian Draft horses with them. Looking for a creative way to use the horses, Bruce, his brother, Keith, and Jim built a horse-drawn wagon that was quickly put into service giving children rides when they visited. One of the first groups of children to visit the “pumpkin patch” was from Shasta Avenue School where Bruce and Linda’s daughter’s attended. The horse-drawn wagon brought intrigue from neighbors and friends who also wanted to visit the farm. Soon the demand for farm visits from other schools and families was greater than the little seven-acre farm could accommodate. 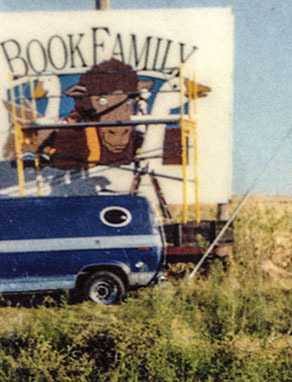 In 1987 the Books relocated to their present location in Durham, a 245-acre piece of land right off of Highway 99 near the Butte College exit. There was enough room for the elder Books, their two sons and families, and daughter, Lillian and her family, to all establish homes on the land. 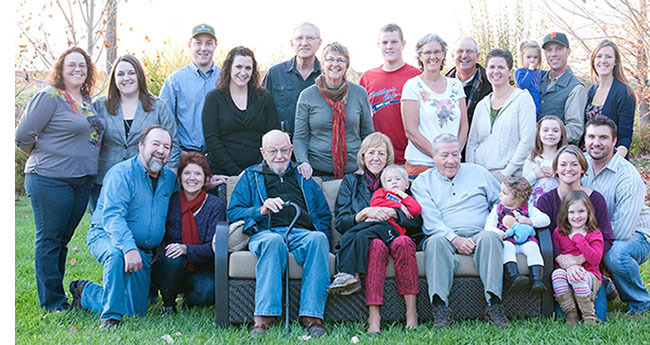 That meant eight adults and eleven children—truly a family farm! 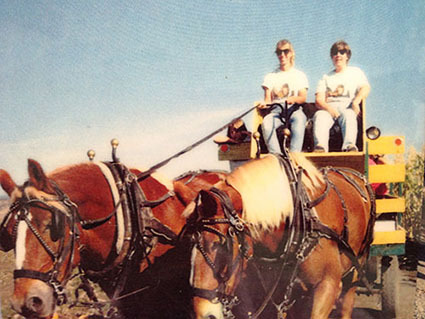 The farm was first called “Book’s Belgian Farm,” named after the type of draft horses they owned, but was later changed to “Book Family Farm,” an easier, less confusing name for people to remember. It was truly a family operation. Keith and Joy Book oversaw the day-to-day operations while the rest of the adults had jobs off the farm. Every October, though, the entire family, along with many friends, joined in the work of running the pumpkin patch. The children all grew up planting, weeding, and picking pumpkins, learning to run the cash register, greeting visitors, selling popcorn, and other aspects of the thriving pumpkin patch business. 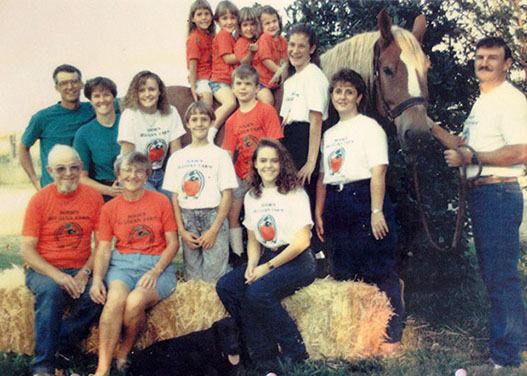 At its peak in the late 1990s, during October the farm accommodated about 15,000 children and adults on field trips during the week with many more families who came to visit on weekends. 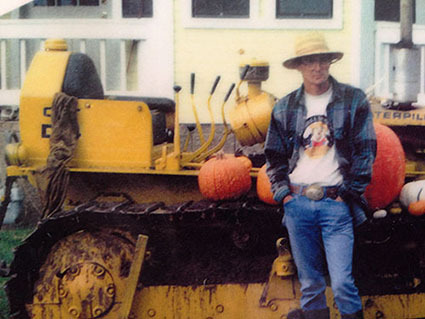 In 2005, Keith and his family accepted a five-year work commitment in Florida, returning every October to manage the pumpkin patch. Grandma Bea died in 2007, and by 2008, most of the children had moved off the farm. Health issues among other family members forced the family to close the pumpkin patch. But in 2009, after experiencing some health issues themselves, Keith and Joy returned to the farm. They had been inspired by author Michael Pollen and farmer/author Joel Salatin, about the role food plays in health. They came to understand that, “It matters what you eat, and what you eat, eats.” They studied grass-based farming, rotational grazing, and how to feed animals according to their natural dietary needs. Upon returning to the farm, Keith and Joy started raising and processing their own meat chickens. A dairy cow, some beef cows, pigs, and laying hens soon followed. The farm reopened to field trips in 2010, not just in October for the pumpkin patch, but year-round so that children and families could have a little taste of farm life. You won’t find the former Pumpkin Patch with concessions, bounce houses, or even a corn maze; instead you will find the day-to-day operation of farm life—feeding the chickens, gathering eggs, milking the cows, and growing the family’s supply of organic vegetables. The Books are delighted to share their passion for the land with those who visit the farm. “We are excited to produce healthy food while at the same time being stewards of the earth.” They invite you to schedule a field trip to the farm any time of year.